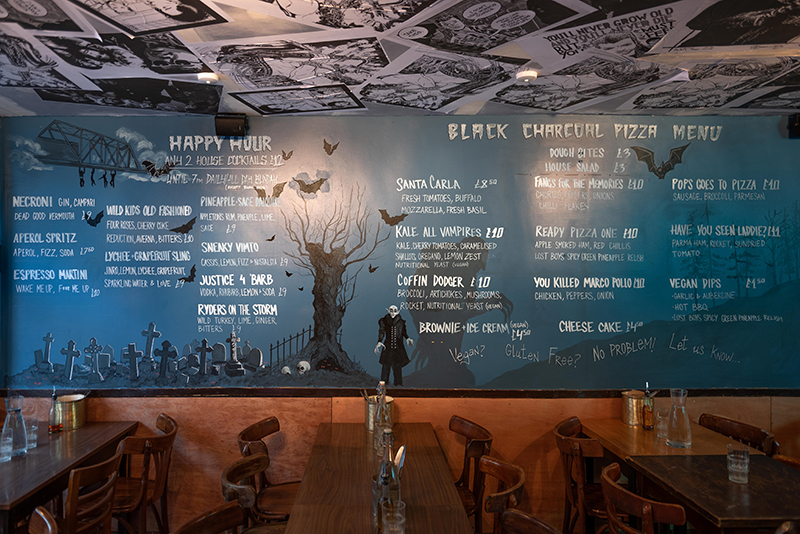 Yes Lost Boys Pizza is the world’s first vampire-themed pizzeria. Well actually it’s the second, as Alex Fisher and Peter Crozier-Clucas opened up the first in Archway in June 2017 and have now added joint number two in Camden. 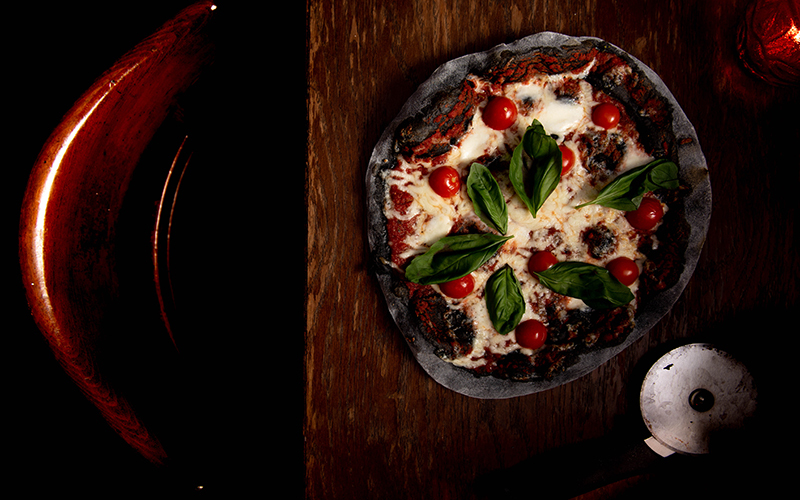 It’s all a throwback to the ’80s (including a strictly 80s soundtrack), hence the name, and the pizza comes black, not because they have been in that pizza oven a tad too long but because of the charcoal in the dough. 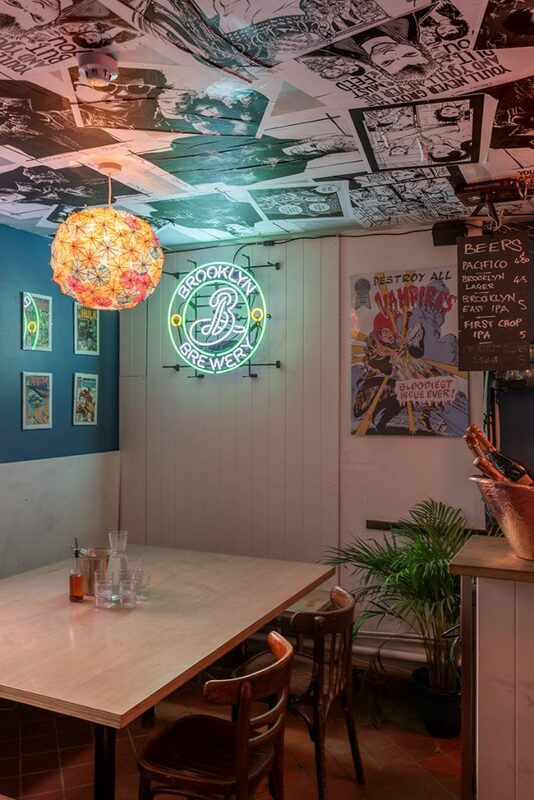 Lost Boys Pizza is made to look like the Frog Brother Comic Book Store in the Lost Boys film, with a big skeleton skull lampshade hanging in the centre of the bar, a blue wall painted with silhouettes of gravestones where the whole menu can be found (saving the planet by not printing out paper ones) and a ceiling full of Lost Boys posters. It’s a vibe. Obvs they’ve gone to town on the vampire-themed names for the pizzas with things like Kale All Vampires and The Coffin Dodger. We’d love to have seen a ‘How Do You Like Your Worms Michael?’ on there and a spaghetti pizza sounds the nuts…maybe they will one day. 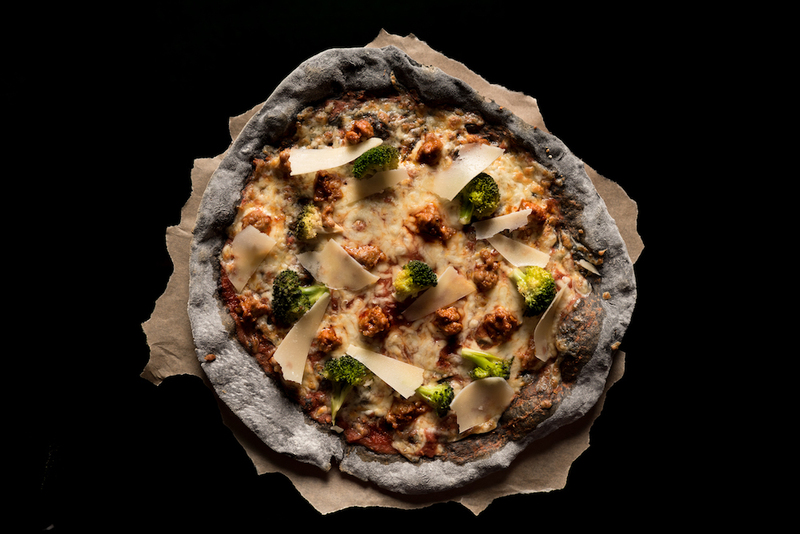 We tucked into the Fangs For the Memories with chorizo, peppers, onions and chilli with their Lost Boys signature black charcoal dough, and it’s a decent pizza. There are some cool vegan numbers on offer too and a pretty good Lost Boys spicy green pineapple relish dip, which also goes well with the black dough balls. Lost Boys has some secrets too, like the absinthe bar Croque Monsieur downstairs, and it gets pretty damn fun down there. Now not many pizza places can say they’ve got one of those in the basement.